The newest Tomb Raider, Shadow of the Tomb Raider, is now out and that means it is time to start… tomb raiding. If you picked up any preorder or special editions of the game, you are owed a few DLC items. Below I will show you how to access Shadow of the Tomb Raider DLC items. Let’s go. Note: You need to complete the prologue up to the Plane Crash Base Camp before you get access to your preorder items (complete the Retrieve Your Gear objective). Getting to this point takes about an hour to complete. Where is Your Skill Booster Pack? 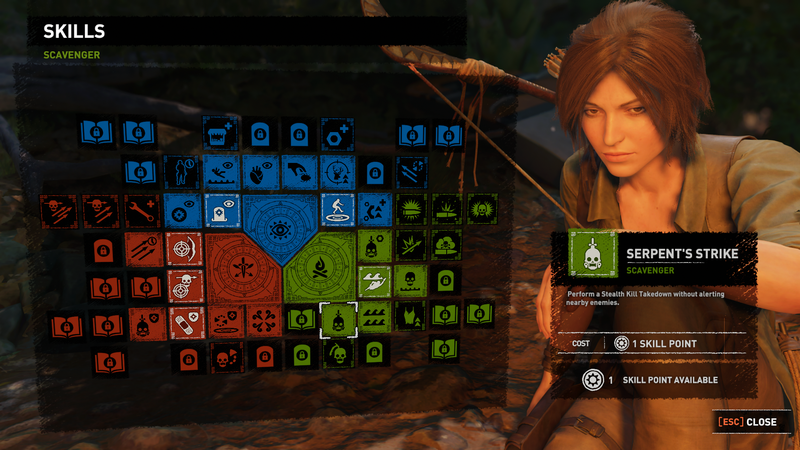 For a limited time, players that pre-purchased Shadow of the Tomb Raider received an additional Skills Booster Pack. This item can be access via the Base Camp Skills menu at the Plane Wreckage Base Camp (or any Base Camp after that). Where are Your DLC Weapons? 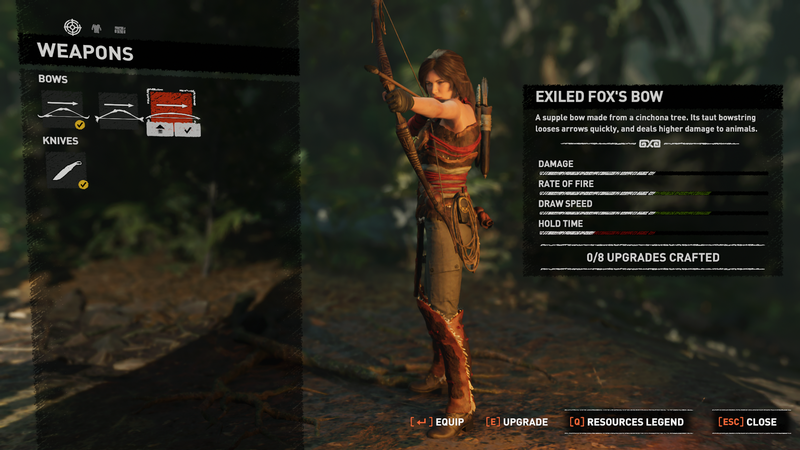 The Exiled Fox’s Bow is one of the preorder weapons. *Guns are not unlocked until you encounter them in the world. You need to continue to the story until you reach enemies with guns and then they become unlocked. This is further in then the Plane Crash Base Camp. How Do You Access the DLC Outfits? One of the outfits you unlock is the Tunic of the Exiled Fox pictured here. Explorer – Increases the amount of harvested natural resources and experience gained from hunting. Robes of Puka Huk – Increases the amount of harvested animal resources and health regeneration. Tactical Adventurer (Black) – Wearing this outfit increases the amount of ammo crafted and grants more experience for stealth kills. Tunic of the Exiled Fox – Wearing this outfit increases experience gained from hunting and duration of Focus Time. 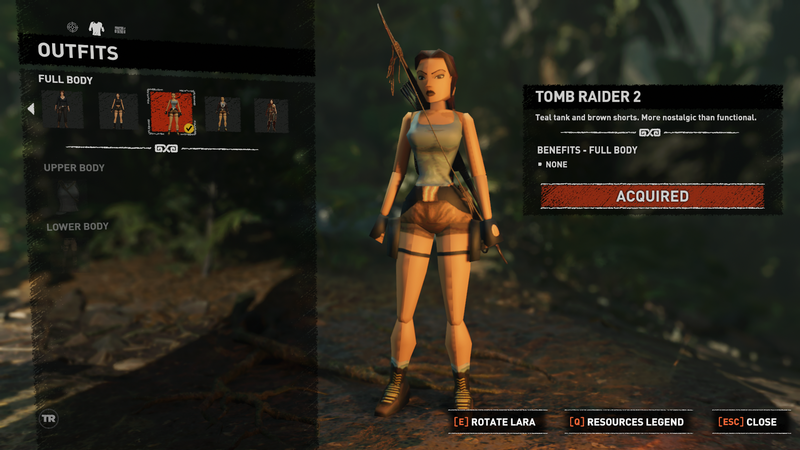 The Tomb Raider 2 Outfit is one of the Legacy Outfits you can receive. You can change your outfits by accessing the Inventory screen at Base Camps. On the inventory scroll right to the shirt icon to access and equip Outfits. You need to reach the first Base Camp in the game to gain access to Outfits. More: How to complete the Whistle in the Dark challenge. More: How to get Eveningstar’s Boots Lower Body Item. 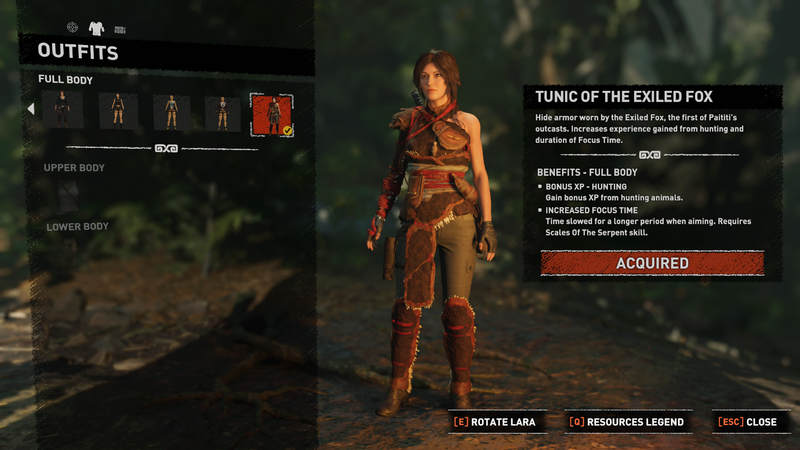 Did our how to access Shadow of the Tomb Raider DLC Items guide help you? Let us know in The Pit below. Almost total fail! Didn’t explain how to access most of this stuff!